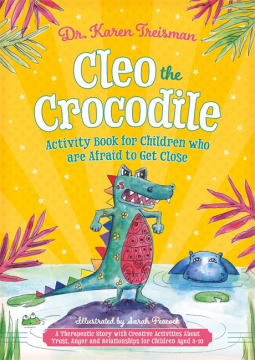 A therapeutic title: Cleo the Crocodile – Joyce's mystery and fiction book reviews with some non-fiction too! While this book looks like just another children’s story/activity book it certainly is not. This one is meant to be a resource for children, mental health professionals and others who are tasked with helping youngsters who have experienced significant trauma. The story of Cleo is told from the point of view of animals so as to allow children to listen without having to initially claim the story as their own. Cleo has had painful experiences but they are all that Cleo has known; change, even if it might be for the better, is scary. Children hearing the story will see that it takes Cleo a long time to trust but that, eventually, things get better. This book then has a series of guided activities that children and their trusted adults can work on together and at their own pace. This resource will be welcomed by social workers, foster carers, therapists and others who work with children who are trying to cope with their difficult histories.